Oranges are at their best at the moment. 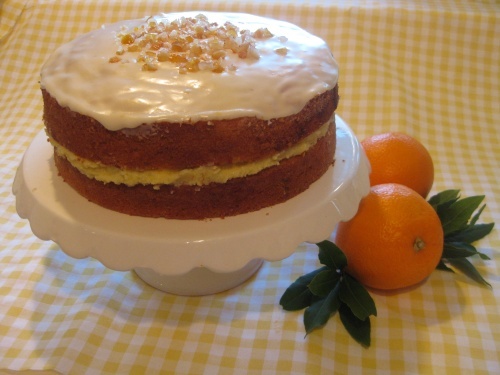 This orange flavoured sponge cake has a complete orange flavour with the orange butter icing filling and orange glacé icing. You will need 2 straight sided sandwich cake tins 20cm (8”) diameter. 1 tbsp candied peel – to decorate. Make the cake: heat the oven to gas 4 / 180 C.
Grease the tins and line with greaseproof paper or silicone paper. Grate the zest from the orange. Cream together the fat and sugar, gradually beat in the eggs and the grated orange zest. Fold in the flour and candied peel. If necessary add the orange juice to make a soft dropping consistency. Divide between the tins and bake for approx. 25 mins or until golden brown and firm to the touch. Turn out onto a cooling rack. When cold sandwich together with the butter icing. Butter Icing: Beat together the butter and icing sugar until soft and creamy, add the grated orange zest and the juice. Icing: Mix the icing sugar and just enough orange juice to coat the back of the spoon and it spread over the cake. Sprinkle a little chopped candied peel in the centre of the top.